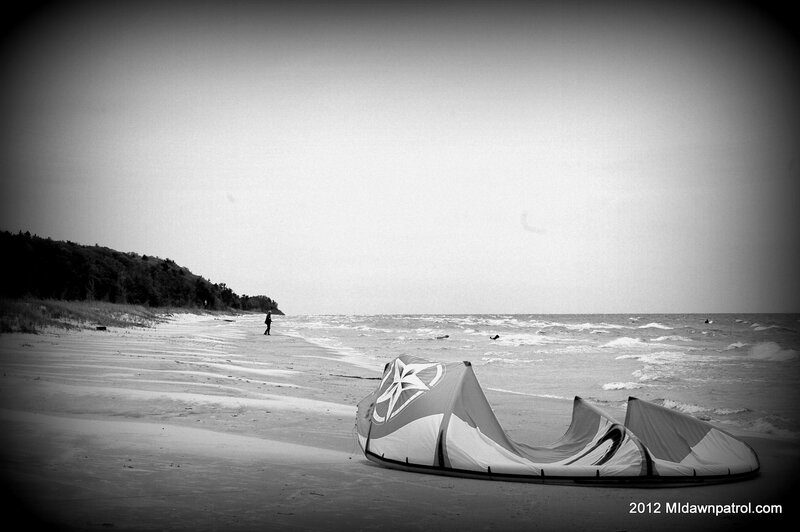 That’s right, we went kiteboarding at Cedar Point this weekend. Saturday (5/12) the marine forecast from Whitehall to Pentwater was for 15 to 20 out of the NW. The wind had been pretty good coming from the NW on sunny days lately so we thought there might be a good chance. We took a ride to Pentwater and headed south from there in search of a beach access and ended up at Cedar Point County Park. It was an awesome location with a little parking lot and some stairs leading down a dune through some cedars and over a small creek to the beach. As we walked down to the beach the wind was steady and whitecaps where on the water. On like donkey kong! Rode our big kites, 12m and 15m for a couple hours in some large chop. The wind was really onshore so the combination of the large chop and onshore wind made for a challenging and tiring ride. Trying to ride upwind and the angle of the chop taking out our boards was a difficult, but a good experience. It was also difficult to boost as the angle of the chop again made it hard to edge and power up before lift off. Despite the challenging conditions it was one of the best Saturday afternoon kiting sessions we’ve had. A sweet new location all to ourselves, dunes, clear, blue water and riding to exhaustion. After, stopped at the Black Bear Saloon in Pentwater for a couple cold one’s and some battered pickle spears. Good shizz 🙂 Pics and video from the day…. Next Post First trip to the Mecca for 2012!